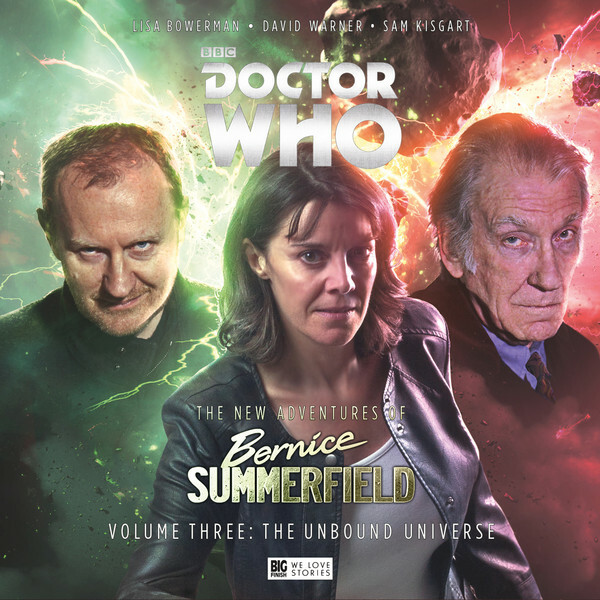 Big BIG FINISH Week: The New Adventures of Bernice Summerfield, Volume 3 – The Unbound Universe | Warped Factor - Words in the Key of Geek. Tony’s not where he expected to be. Big Finish has always created Doctor Who stories for existing fans of the show, rather than the new young audience that’s key to the success of the TV version. The third Benny new adventures box set takes place in a space and time defined by the power of fandom squared, pairing a character who came to life in a Virgin New Adventures novel and Big Finish audios with a Doctor who exists solely in a separate audio universe, entirely conjured up to play with hypothetical scenarios contrary to the TV version of Doctor Who. What do you need to know? Well, first, it’s Bernice Summerfield, played by Lisa Bowerman, so there’ll be fizz and snap, realism, banter and a craving for shiny things, all given a signature spin by Bowerman that keeps the listener moving forward while keeping them engaged, waiting for the next thing out of Benny’s mouth. More than Paul Cornell’s original, it’s the power of Bowerman’s performance that means we’re still getting Bernice Summerfield releases in 2016. While Bowerman’s Summerfield is in the universe – any universe – there’s joy, there’s compassion, there’s fun, there’s glorious crossness and there’s by no means being born yesterday. More from Bowerman’s Benny is always a good thing, so we should probably stop writing now and you should go away and get it, and treat your lugholes to four hours they’ll thank you for. Alright, fine, you want more than Bowerman’s Benny? This time out she’s not just in the Unbound Universe, she’s in the chunk of it ruled by David ‘Makes Everything Three Times Better Just By Turning Up’ Warner, as an alternative Third Doctor. He appeared in two of the Unbound stories, Sympathy For The Devil and Masters of War, as ‘The Cautious Doctor.’ This box set explores what happens when a cautious Doctor meets the irrepressible enthusiasm and clout of Bernice Summerfield. The Unbound Universe is never going to be the same again. There’s a blend of Classic and New Who in the four stories of this set – each of them is technically an alternative take on a Classic story, but you’ll be forgiven for spotting similarities to New Who stories too. We won’t spoil the game for you here, because the box set is not about the riffs on previous stories. They’re just there for your Easter Egg enjoyment. James Goss kicks us off with The Library In The Body, giving us an uncomplicated pre-credits whisk of Benny into the Unbound Universe and a story set in the last library in creation. The universe is dying and the only currency is knowledge, so naturally enough, anyone left alive flocks there, including some number-singing space nuns (who come complete with space guns and fixations with a long-dead party saint and cups of tea), led by their Mother Superior, played by another ‘Makes Everything Better’ actress, Rowena Cooper. Other Librarygoers include the last Cyborg-King, the cleverest man in the universe (no, apparently, not the Doctor), played by Guy Adams, annnnnd oh yes, a race called the Kareem who believe knowledge is the root of all evil. It’s fairly safe to say they aim to misbehave. When people start dying, it’s a race to find out who’s killing whom and why, and by the end of the story, what seemed senseless and creepy is rendered sensible. Still creepy, but sensible. It’s Benny who works it out in this story, again underlining her power and her personality, and what’s more, under her influence, the Cautious Doctor begins to engage with his universe-saving instincts more than ever before – he begins to become more like the Doctors our Benny is used to, across a story that’s as mad as anything that ever happened on Peladon, but with that special Benny banter to power it on. Planet X, written by Guy Adams, is a more ‘Let’s go somewhere and have adventures’ story, the Tardis showing just three planets it can reach, and Benny insisting on her choice – Planet X, which the Doctor claims will probably kill them with sheer boredom. Adams takes a couple of premises – the mid-70s disappointment at boring subsidiary species of the week (*cough, cough, Exxilons, cough) and something distinctly Seventh Doctorish included – and extends them to their logical conclusion. Planet X is officially the Planet of the Dull People, whether the people want it to be or not. It’s a standard ‘dictatorship for the good of the people,’ but there’s lots of extra bite in the way the situation on Planet X is maintained. While the Doctor busies himself threatening the planet’s Prime Minister and being just a little bit tortured, Bernice finds herself thrust into the role of protector of the scared and the innocently interesting, helping at least one of the planet’s little people to escape the greyness of its regime. Here the action feels more equally distributed, Warner channelling some Capaldi scorn into his Doctor, and Bowerman showing us Benny as the favourite aunt of the helpless, who leads them into trouble, but then protects them all the way through to the other side. There’s an altogether obvious note about Adams’ script, a sense of ‘why has no one thought of this before?’ that brings a certain horrifying inevitability to the action, but Planet X is one you won’t forget in a hurry – its premise and its grimness, swirled through with comedy, won’t let you. The Very Dark Thing, by Una McCormack, is where things get extremely funny, and simultaneously, extremely…erm…well, dark. It’s important to understand that there has been a vast and terrible war in the Unbound Universe – not a Time War, because the Daleks aren’t all they’re cracked up to be in this universe, but a Reality War, between a vast and powerful empire and essentially everyone else. There are dark and terrible weapons in a war like that, and one of them was used on Tramatz, heart of the vast and powerful empire. It’s had cataclysmic consequences across the universe, but here on Tramatz, everyone’s away with the fairies – and whatever you do, you shouldn’t joke about the unicorns. Warhammer meets My Little Pony, McCormack’s script is trippy, but it’s also, in the best Who traditions, a dark satire on the willingness of humans to be distracted from the terrible things they’ve done by any available fairy tale. Even this Doctor, himself no stranger to terrible things, is lulled into the illusions of Tramatz, leaving Benny to get volcano-cross, snap him out of it and again to lead the innocent to the end of the world they know to find a better tomorrow. Ultimately, it’s Benny’s actions, and those of her charge, Megatz (played with heartbreaking innocence by Kerry Gooderson), that bring peace and a kind of pricy resolution after a devastating war. The set is brought to a suitably grandiose conclusion with Emporium At The End, written by Emma Reeves. It’s the end of everything and the Emporium at the End Of The Universe is offering everything you could wish for – including a ticket out of the universe. But there’s a price. A price that could make you forget the things you never should. Memory for survival – which would you choose? Bringing the welcome return of Sam Kisgart (ahem), starring here as The Manager, Emporium At The End is a romp, with gorgeously over-the-top schemes, cybernetic sub-plots, heartbreak, a little seduction, much wine, the return of the singing nuns of St Beedlix and some top-form dastardliness, but more than any of that, there’s a defining moment for the Cautious Doctor – a moment that helps explain at least some of why he is the way he is, and what his life has cost him. What there isn’t is any distinct resolution. Benny ends the box set still in the Unbound Universe, still with the Warner Doctor. The extras (you’re going to want to listen to all of the extras) make it clear that the go-ahead’s been given for more Benny stories in the Unbound Universe, but that the next set will be very different. Perhaps it will give some of the other Unbound Doctors a chance to experience the Bernice Summerfield magic for themselves. Volume 3 combines the brilliance of Benny with the bonkersness of the Unbound Universe, but played for drama, so the threats matter, the people’s lives are hard and the evil goatee-wearing gits are bluntly cynical. Bernice Summerfield can make a difference to worlds like that – whichever universe they’re in.